I'm pleased to announce that Hugh Owen, the director of the Kolbe Center for the Study of Creation, will be visiting the Bryan College campus in November to present a lecture on the creation/evolution debate from a Catholic perspective. The Kolbe Center is the leading young-age creationist advocacy group among Catholic Christians, and Mr. Owen's lecture will give our students an excellent opportunity to view the creation/evolution debate from a different theological tradition altogether. Mr. Owen will speak on Monday evening, November 15 at 5:00 p.m. in Mercer Hall 139 (the classroom right across the hall from the Henning Museum). The lecture will last about 45 minutes and is free to the public. Mr. Owen's lecture is part of the ongoing journal club meetings sponsored by the Center for Origins Research at Bryan College. I just got my copy of the latest Journal of Creation with several noteworthy articles. My first surprise was Peter Line's Homo gautengensis article that opens the issue. Unlike the online version, the print version stops just before the section where he criticizes my hominid baraminology paper. I suppose this could be just an editorial decision to shorten the article, or maybe Line decided to hold off his criticism until he could write a whole paper? I don't know. I'm actually disappointed, since I would prefer to cite his criticisms from a published paper rather than some webpage. 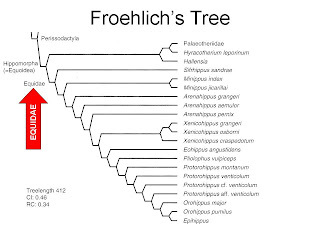 Froehlich. 2002. Quo vadis eohippus? The systematics and taxonomy of the early Eocene equids (Perissodactyla). Zool J Linn Soc 134:141-256. Seriously, why do humans die? Yeah, I know about the tree in the Garden of Eden and all, but why biologically do we die? Is it because we've built up a bunch of mutations that gradually kill us as we age? Or is it because we're genetically programmed to live a certain lifespan? I think it's the latter. This week's PNAS has an interesting article looking at common disease-risk alleles (AKA genes that predispose you to diseases like cancer or heart disease) in young people and old people. Guess what? There doesn't seem to be much correlation between the occurrence of common disease-risk alleles and longevity. The authors of the study, Beekman et al., put it this way: "Longevity in this study population is not compromised by the cumulative effect of this set of risk alleles for common disease." It's fall break! At last I can catch my breath. Over the past month or so, things have been put off, including this blog. I've been saving up interesting papers to talk about, so this week I'll try to get some posts up about these. Meanwhile, I submitted my response to Senter to JEB. We'll see how it goes. A couple weeks back in Science, McDaniel et al. reported an immensely exciting result, but I don't recall that it got a lot of press. They looked at "gene transfer agents" (GTAs), which are virus-like particles produced by alpha proteobacteria that can transfer random bits of genomes between different species of bacteria. Looking at nine strains of marine alpha proteobacteria grown in simulated ecological conditions, McDaniel et al. found that these bacteria produced GTAs and that they increased the estimated gene transfer in the ocean by a factor of thousands to hundreds of millions. Hundreds of millions. That's a lot. Isn't it funny how AIG is quick to point out that it doesn't take a Ph.D. to know the alleged problems with evolution, but when someone questions one of their employee's ideas, they hide behind that person's credentials? UPDATE: While I'm fixing the link, I might add that I don't need a Ph.D. in astrophysics to recognize nonscientific special pleading. In a new paper from the Botanical Journal of the Linnean Society, Pellicer et al. report that the plant Paris japonica has the largest genome of all at 152 pg. For those keeping score, that's a whopping 50 times the size of the human genome, and about 300,000 times the size of the smallest bacterial genome. Impressive. Pellicer et al. 2010. The largest eukaryotic genome of them all?Biol J Linn Soc 164(1):10-15. I've always thought that the Flood must have been a bonanza for oceanic microorganisms. The ocean seriously heats up, and volcanoes kick out all sorts of interesting useful stuff (like iron). That's exactly what microorganisms love. So when I look at the cliffs of Dover, I think, "That must have been one massive bloom." There's an interesting new paper by Hamme et al. in Geophysical Research Letters looking at the phytoplankton response to a recent volcanic eruption. Guess what? It was huge. The erupting volcano was Kasatochi in the Aleutians in 2008, and it spewed volcanic ash over a big part of the northeast Pacific. Hamme et al. describe the resulting plankton bloom as "one of the largest phytoplankton blooms observed in the subarctic North Pacific." Cool. I've had a very busy couple of weeks here, so I'm still catching up on blog-worthy news. The biggest thing I saw last week was Jason Lisle's response to a critic on the AIG website. Posed with some questions that I have wondered myself (although not so irreligiously), Lisle defends his anisotropic synchrony convention, and the result is extremely revealing.